Winding your camera with your thumb you may be able to take pictures at the rate of 1 picture per second. Investing in a motor drive you can up the frequency to maybe 5 to 10 pictures per second. If you want to go faster yet you can spend more money yet and buy an intermittent motion picture camera which will take you up to about 64 picture per second. However, believe it or not, you can take 500, or even 1000 plus, pictures per second with nothing more advanced or complicated than your basic, standard Single Lens Reflex camera and with nothing more additional than a bunch of small mirrors. A fundamental question to ask is "what is the limiting factor that precludes any camera from making pictures above a given rate?" The answer is typically that the limiting factors are the rate at which film can be advanced and the shutter wound. In fact, these plus exposure time are the limiting factors. If one could reduce film winding and shutter cocking time to zero one would still have to contend with exposure time unless it would be permissible to start making a second picture before the exposure for first one were already finished. In a 35mm SLR typically we can not make the next picture before the shutter has completed it's travel across the gate of the camera. Then, if the exposure time could be neglected, we could assume that the curtain traverse time would be the limiting factor. Therefore it is useful to know approximately what the curtain traverse time is in your camera. This time is actually suggested by the manufacturer when they give you the X sync speed of the camera. Manufacturers usually come as close as possible to the actual minimum time because short X sync speeds are a desirable feature to enhance sales of the camera. So, if the X sync speed is 1/60 second and the exposure time is negligible (such as if the exposure time is set to 1/1000 second) the maximum framing rate achievable by this camera would be about 60 pictures per second. Another way of saying this is that the camera could make one picture each 1/60 second. How could we make the camera take more than 60 pictures per second?. Well, once the shutter cocking time is reduced to zero the only way we could do this would be to use the same shutter to make 2 pictures during its transit of the 35mm camera's image gate. To do this all we need to do is devise a means for placing two (or more) images of the same subject side by side on the 24 x 36 mm gate of the camera. An early method for accomplishing this was described by Leitz technicians many years ago but the technique has been somewhat improved upon in my High Speed Laboratory over the years. In fact, an early description and application for enhancing the framing rate of a SLR was published in the June 1982 issue of Modern Photography magazine. To make the camera take more than one picture during a single exposure first procure a set of about 10 mirrors. They can be any size but for experimental work mine are about 50 x 100 mm in size. You can use second surface mirrors but first surface ones are more desirable as they do not produce a faint secondary ghost image on the final record. Now line them up in a row on a table in front of the camera at such a distance from the camera that as you look through the viewfinder they extend from one edge of the finder to the other. The actual distance will depend on the lens used and typically the longer the lens focal length the better but normal focal length lenses are also suitable. Make sure that the camera is oriented so that the camera's focal plane shutter will move from side to side. With a camera equipped with a vertically moving shutter turn the camera on its side and use only 7 mirrors if you want the final image size to be about the same as if you had 10 going lengthwise. Next to the camera will be the "stage" upon which your high speed event will take place. To ensure that the distance from this stage to your camera by way of the mirrors will be is the same for all mirrors take a string and while you hold one end on the camera lens and the other on the stage, adjust the length of the string so that if a pencil is placed at the center mirror with the string going around the pencil the string will be tightly stretched. Now holding the string ends stationary, ask a friend to draw an arc on the table by moving the pencil left and right of center while keeping the string taut. The arc generated will be part of an ellipse. Now place the mirrors in small dabs of putty or modelling clay and place the mirrors each touching the edge of the next and so that they line-up along the drawn arc and extend from edge to edge across the viewfinder of your camera. Now comes the fun part of adjusting the exact angle of each mirror. Place your "action event", a small fan for example, on the stage and while looking through the viewfinder ask your friend to adjust the angle of the center mirror and then each mirror in turn so that eventually they all reflect an image of the fan in their surface. Focusing the camera on the image appearing in any one mirror now should also bring the image in every other mirror to a focus. You now should see 10 neatly arranged and sharply focused images of the fan extending from one side of the frame to the other. At this time you are about to begin the photography. It is advisable to set your shutter speed to the highest speed available on your specific camera in order to ensure that you will record sharp images of whatever you will be photographing. The exposure time you choose will not, however, have any effect on the frequency, or pictures per second, that you will achieve. The picture frequency is strictly controlled by the transit time of the shutter curtains and the number of mirrors. Now increase the lighting level or adjust the aperture so that your subject will be properly exposed with the film and exposure time you will be using. It is best to use an incident light meter at the subject location to determine proper exposure or a reflected meter reading with a grey card at the subject location. You may wish to add 1/2 to 1 stop extra exposure due to the small amount of light that might be lost by absorption in the mirrors. At this time, if you release the shutter, your camera will be taking pictures at about 600 pictures per second, BELIEVE IT OR NOT! This is so because in the 1/60 second it takes the leading curtain of the focal plane shutter to move from one side to the other, its edge uncovers sequentially the individual mirrors lined up along the image gate of the camera. Since in this time the camera makes 10 pictures in sequence you have in fact made pictures at a rate achievable only by rather specialized high speed motion picture cameras. Note that the transit time of the shutter curtains is constant with the only factor altered as the exposure time is changed being the distance between the leading and trailing edges of the shutter curtain. If you wish to be more precise, note that the X sync speed is not actually the curtain transit time. That 1/60 second includes time that the manufacturer must allow for the electronic flash to burn and some "tolerance" that is also built into the shutter. Assuming that the allowance for the flash is 1/250 second and that manufacturing errors are allowed another 1/250 second, the total transit time is 1/250 + 1/250 + 1/transit time = 1/60 second. This gives a transit time of about 1/125 second and thus with a 10 mirror system as described above the actual framing rate would be over 1250 pictures per second. Not shabby. In addition to estimating the transit time from assumed camera performance parametres, the results of photographing a fan that is rotating at a known frequency can be "worked backwards" to determine the framing rate of the system. The system obviously has some drawbacks which will become painfully obvious as you attempt to make high speed sequences with this system. For one, you are limited to only 10 pictures and each will only be 3.6 x 7.2 mm in size. Second, the total time you have available to take pictures is only about as long as your X sync speed is. In fact only as long as the curtain traverse time is. Therefore, synchronization between your event and the operation of your shutter is critical. Finally the focal plane shutter scans each image and the point of view varies throughout the series. While there are other concerns that you might discover as well I suggest that this very simple system points out capabilities and limitations associated with other much more sophisticated and expensive high speed imaging devices. For one, to achieve higher framing rates typically one of the first things that designers compromise on is image size. Well, this system has reduced images from 24 x 36 mm to 3.2 x 7.6 mm each. Another compromise that is made in ultra high speed recording systems is on the total number of images collected. It is not unusual to have ultra-high speed cameras that are only capable of recording 4 to 18 pictures at fantastic rates exceeding millions of pictures per second but this number of pictures is in the same ballpark as this simple and cheap high speed system also allows. Obviously, with this as with the most sophisticated high speed camera systems, with the possible exception of the Ektapro EM High Speed video system, synchronization is of great if not paramount importance due to the high framing rate and the few numbers of pictures that can be obtained. On the other hand, as in "real" systems, typically few pictures are recorded not so much because it would not be possible to generate more but because few are sufficient. Running a camera at a million pictures per second for even a full second would generate so much data and volume that it would be impractical to handle and in effect much of it would, under normal conditions, be wasted. As stated above, by making the mirrors even smaller you can increase the number and frequency. This is at the expense of "resolution" or fine detail rendering within your subjects. This actually only affects you in the direction the curtain is moving since the height of the mirrors can extend across the full width (or length) of the frame depending in which direction the curtain moves. In addition, modern shutters move significantly faster than the model used for this demonstration and so higher framing speed can be obtained by using a faster moving shutter ... but, of course, at the expense of recording time. The faster the curtain moves the less time is available for making the sequence. The changing viewpoint problem is also encountered in other high-speed recording systems such as the Cranz-Schardin scheme of triggering several light sources in rapid succession and recording schlieren or transilluminated images in sequence. On the other hand, consider that this approach could yield a stereo image of those parts of the event that remained stationary. Another limitation, not often encountered in sophisticated systems, is the fact that in this one, since the velocity of the curtain is not uniform across the gate, the time between pictures is not constant. However, for the purposes that this project is designed to serve, this small error can and should be ignored. Or it could be made into a subject of study in itself. It should be recognized that this simple system obviously works because no shutter cocking or film advance mechanism is needed. The consecutive mirror images are exposed to the film sequentially strictly by the fact that the shutter curtain moves from one side of the gate to the other over time. Since the second curtain may cover a portion of a given mirror when the first curtain has already started to uncover the next mirror an interesting artifact is possible and this is that the exposure for a given "frame" can start before the exposure for the previous frame has ended. This is usually not the case in standard high speed systems but is an effect that can be seen in some types of ultra-high speed rotating mirror framing cameras. Finally, since it is the scanning action of the moving edge of the focal plane shutter that is responsible for the sequential exposure of the frames this can lead to "focal plane shutter distortion" within each image. This is a distortion associated with shutters that scan a piece of film rather than exposing it simultaneously everywhere. This artifact is common also with scanning shuttering designs incorporated in most sophisticated motion picture type high speed cameras. Note that each limitation of this system as mentioned above can be used as a learning experience to become acquainted with the problems facing a designer of real high speed imaging systems. And note also that this simple experiment may open up other avenues for experimentation. If you are adventuresome use this system to determine the RPM of a rotating fan. Place a mark on one of the fan's blades and photograph it at various voltages as described above. When done you should have a set of images that show progressive displacement of the fan across the mirrors. The displacement will be highest with the fan turning at its highest rate. Because this is a repeating event you will have no synchronization problem. Determine framing rate as simply as possible, eg. number of mirrors divided by X sync speed, or by allowing for as many "finesse" factors as you wish. To determine the fan's rotation rate you can actually proceed two ways. Either base the calculation on displacement between mirrors or by displacement between two locations on the film with the distance between these two spots being measured. Using the first system first identify two mirrors where the location of the fan blade is easy to assign a location in a circle and thus allowing you to: 1. estimate the number of degrees turned. 2. Divide number of mirrors minus one by the framing rate. Take 1. and divide by 2. and this will be the number of degrees the fan turns per second. Divide this by 6 and you have RPM. You might try checking this with a stroboscope to analyze for error. I can guarantee there will be some. Or, identify the location on a contact print of two spots that you can identify and between which the displacement of the fan can be reliably identified. 1. Note what the fan displacement is between these two points in degrees. 2. Now measure the distance between these two points. It should be less than 36mm. 3. Divide 36mm by the transit time you determined or assumed, such as 1/60 second or 1/125 second, etc. This is the curtain edge velocity. Now divide 2. by 3. This gives 4., the elapsed time for the shutter to get from the first position of the fan to the second. Now divide 1. by 4. and this is the fan RPS. Divide this by 6 and you have RPM. After finding the RPM at various voltages it would be interesting to plot a graph of RPM vs. Voltage applied to the fan. There are many other applications for this little high speed system. Probably none in any sophisticated application but I think there is so much to learn in terms of understanding the principles at work in high speed imaging systems that it is well worth practicing with it even if you have already used the latest technology. Or, believe it or not, you could take 500 or more pictures per second with nothing more advanced or complicated than your standard Single Lens Reflex camera and nothing more additional than a bunch of small mirrors. There are various factors that limit any camera from making pictures above a given rate. These are the rate at which film can be advanced, the shutter wound, the exposure time (unless it is allowable to start making a second picture before the exposure for first one is already finished) and, in a 35mm SLR the time it takes the shutter to travel across the gate of the camera. Therefore, even if in a 35mm SLR we could reduce the first three factors to negligible times, we would still be limited by the last factor. This is exactly what we are going to do. But first, to determine the theoretical maximum rate we need to know the actual curtain traverse time. This is suggested by the manufacturer. It is the X sync speed of the camera. Manufacturers usually specify this speed as close as possible to the actual minimum time because short X sync speeds enhance sales of the camera. So, if exposure time, film winding and shutter cocking could all be neglected, the maximum framing rate achievable by a camera with 1/60 sec. X sync speed would be about 1/60 sec. per picture or about 60 pictures per second. How could we make the camera take more than 60 pictures per second?. By taking more than one picture during the time it takes the curtain to travel across the gate, of course. This way we need not worry about winding the shutter or moving the film. We will also neglect the effects of exposure time. An early method for accomplishing this was described by Leitz technicians many years ago but the technique has been somewhat improved over the years in my High Speed Laboratory. It is done with mirrors! For a basic set-up, first procure a set of about 10 mirrors. They can be any size but for convenience mine are about 75 x 125 mm in size. First surface are best but second surface mirrors can also be used. Line them up in a row on a table in front of the camera at such a distance from the lens that as you look through the viewfinder they extend from one edge of the finder to the other. Make sure the camera's focal plane shutter will move from side to side. 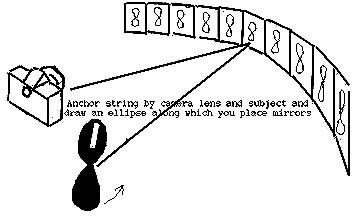 If your camera has a vertically moving shutter turn the camera on its side and use only 7 mirrors. Next to the camera will be the "stage" upon which your high speed event will take place. Make the distance from this stage to your lens by way of the mirrors be the same for all mirrors. To do this take a string and holding one end on the lens and the other on the stage, adjust the length of the string so that when a pencil is placed at the center mirror with the string going around the pencil the string is tightly stretched. Holding the string ends stationary, ask a friend to draw an arc on the table by moving the pencil left and right of center while keeping the string taut. The arc generated will be part of an ellipse. Place the mirrors in small dabs of putty or modelling clay and place the mirrors each touching the edge of the next. They should line-up along the drawn arc and extend from edge to edge across the viewfinder. Now comes the fun part of adjusting the exact angle of each mirror. Place your "action event", a small fan for example, on the stage and while looking through the viewfinder ask your friend to adjust the angle of the mirrors so that eventually they all reflect an image of the fan in their surface. Focus the camera. You should now see 10 neatly arranged and sharply focused images of the fan extending across the viewfinder. Now you are about to begin photography. It is advisable to set your shutter speed to the highest speed available in order to ensure that you will record sharp images of whatever you will be photographing. The exposure time you choose will not, however, have any effect on the frequency that you will achieve. The recording frequency is strictly controlled by the transit time of the shutter curtains and the number of mirrors. Now adjust the aperture so that your subject will be properly exposed with the lighting, film and exposure time you will be using. It is best to use an incident light meter at the subject location to determine proper exposure. When you now release the shutter, your camera will be taking pictures at about 600 pictures per second, BELIEVE IT OR NOT! This is because in the 1/60 second it takes the leading curtain of the focal plane shutter to move from one side to the other, its edge uncovers sequentially the individual mirrors lined up along the image gate of the camera. Since in 1/60 sec. you exposed 10 pictures sequentially the rate is 600 pictures per second and it compares favorably with fairly specialized high speed motion picture cameras. To be more precise, note that the X sync speed is not actually the curtain transit time. That 1/60 second includes time that must be allowed for the electronic flash to burn and some manufacturing "tolerance". Assuming that the allowance for the flash is 1/250 second and that tolerances are allowed another 1/250 second, the total transit time is 1/250 + 1/250 + 1/transit time = 1/60 second. This gives a transit time of about 1/125 second and thus the 10 mirror system as described would perform at a framing rate of about 1250 pictures per second. Not shabby. The system obviously has some drawbacks that will become painfully obvious as you attempt to make high speed sequences with it. It will also point out similarities to more complex systems, however. For one, just as with sophisticated systems, in this one high framing rates are obtained at the expense of image size. The next compromise is on the total number of images collected which makes synchronization become a significant problem. The total recording time available is short and the total number of pictures obtained is small. As in some ultra-high speed systems, this one also introduces a changing the viewpoint between pictures. Consider, however, that it yields a stereo image of those parts of the event that remained stationary. Finally, since it is the scanning action of the moving edge of the focal plane shutter that is responsible for the sequential exposure of the frames this can lead to "focal plane shutter distortion" within each image. Note that each limitation of this system as mentioned above can be used as a learning experience for appreciating some of the problems facing a designer of real high speed imaging systems. Note also that this simple experiment may open up other avenues for experimentation. If you are adventuresome use this system to determine the RPM of a rotating fan. Place a mark on one of the fan's blades and photograph it at various voltages as described above. When done you should have a set of images that show progressive displacement of the fan across the mirrors. Determine framing rate as simply as possible, eg. number of mirrors divided by X sync speed, or by allowing for as many "finesse" factors as you wish. To determine the fan's rotation rate you can actually proceed various ways. One approach is to base the calculation on displacement between mirrors. For this method, identify two mirrors where the location of the fan blade is easy to identify. Now, 1. Estimate the number of degrees turned between those mirrors. 2. Divide the number of mirrors minus one by the estimated framing rate. Take 1. and divide by 2. This is the number of degrees the fan turns per second. Divide this by 6 and you have RPM. You might try checking this with a stroboscope to analyze for error. I can guarantee there will be some. After finding the RPM at various voltages it would be interesting to plot a graph of RPM vs. voltage applied to the fan.